Women on a Mission: Mom Edition: WTF (way too fun): SUSHI PARTY! 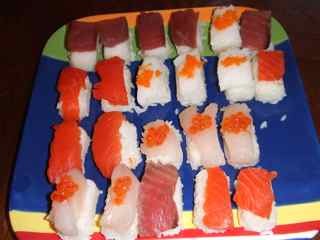 My hubby and I like to entertain and yes, we even eat sushi in our little city, ND town! Steve introduced me to sushi (which he grew to love while living in LA). Unfortunately our city doesn’t have a local sushi establishment, however Fargo has lots of options and trust us—they are GREAT! 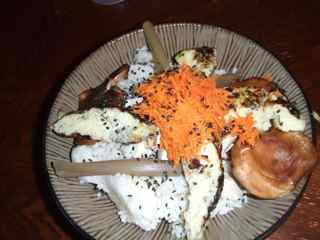 Steve loves to cook international cuisine…Indian, Thai, Japanese, and so much more. We have several go-to recipe FAVES…however, Steve likes to try new things. 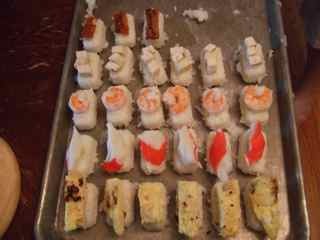 Steve and I both work at a college and to celebrate the end of summer (prior to classes starting)…we threw a sushi party! This is the second annual! We shipped in from Seattle red snapper, king salmon, albacore tuna, ahi tuna, and sea bass. It came fresh and it was delicious! Now, this party wasn’t exactly thrifty—this will be a once a year occurrence. However, we still have lots of fresh fish in our freezer (and Steve has a fabulous salmon recipe—future post). 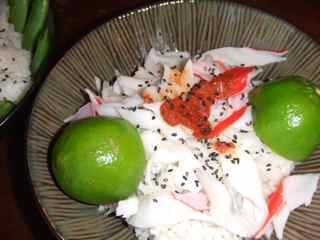 Steve whipped up in our rice cooker (which is an appliance I would recommend owning), sushi rice (or sticky rice). (I apologize for the lack of action cooking shots...but I was having too much fun!) Sticky rice becomes sticky from a combination of Japanese rice vinegar, sugar, salt boiled and cooled. New this year, was a nigiri press, which made the nigiri look super fancy. 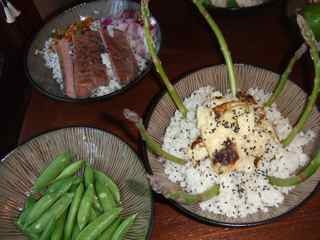 Steve also rolled rolls using sea weed (edible and yummy). 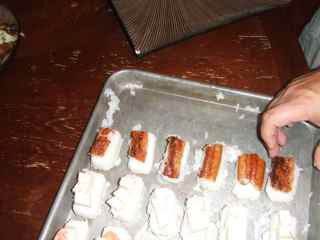 My fave—was the Steve roll…..which was made using salmon, salmon roe, cream cheese, cucumber, red onion, and carrot. 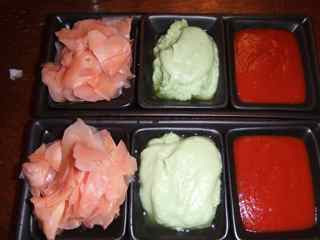 Steve also prepared several colorful bowls of scattered sushi. And of course the party isn’t complete without lots of cocktail options. Cocktails included sake, Sapporo Japanese Beer, and other local faves (gin and tonic—my fave). WOMS—LOVE A GOOD PARTY! And this was…a good party! MORE PARTIES TO COME!